Our toughest hardwood decking is manufactured from opepe, a timber famed for its density and durability. Used extensively for dykes and coastal protection, opepe is exceptionally strong, tough and long-lasting. The colour of opepe ranges from dark honey to golden yellow although overall, the colour is one of the most consistent when compared to other hardwood species. Opepe also has the advantage of not suffering from some of the afflictions suffered by other species, such as pin worm hole, excessive warping or blue stain. Although, like all timbers, opepe will weather to a silver-grey colour after a couple of years of outdoor use, its original colour can be maintained with the use of an exterior grade decking oil. Provenance Africa with a certificate of legality (EUTR). Appearance The colour of opepe ranges from dark honey to golden yellow although overall, the colour is one of the most consistent when compared to other hardwood species.There are very few knots in opepe. 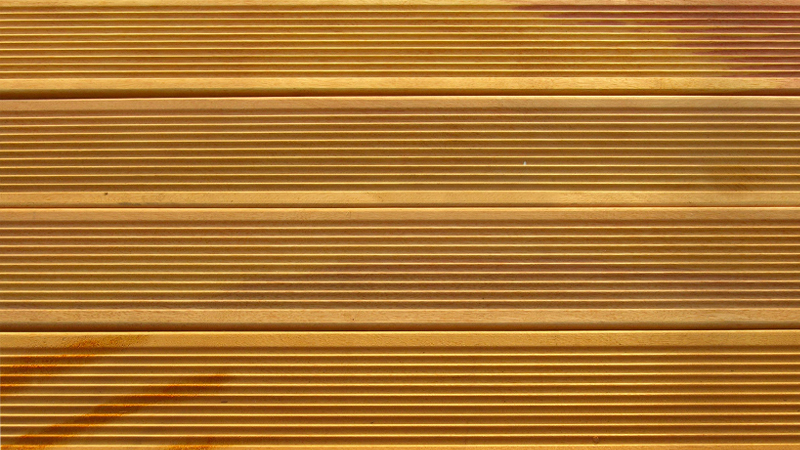 The grain may be coarse and interlocked which will produce an attractive striped appearance on some boards. Opepe will develop small surface checks (cracks) as it dries out but these do not affect the strength of the timber. Lengths Random from 2.0mt to 4.5mt. Subject to availability. Moisture content Air dried. Approximately 16 – 20%. Strength Class D50. High crushing strength but low resistance to shock loads. Insect attack Resistant to marine borers. Powder post beetle will attack sapwood. Chemical properties No problematic chemical properties. Working properties Opepe is a very hard wood which will blunt tools quickly. However, a very smooth finish can be achieved with a sharp cutting edge.